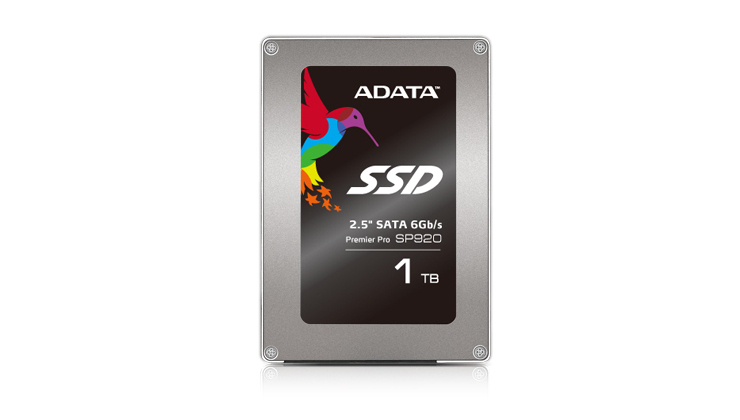 Taipei, Taiwan – April 2, 2014 – ADATA™ Technology, a leading manufacturer of high-performance DRAM modules and NAND Flash application products, today announces the launch of the Premier Pro series SP920 solid state drive (SSD). Designed to meet the high-performance requirements of multimedia file transfers, the SP920 is equipped with the latest generation Marvell controller implementing the SATA III 6Gb/sec specification. SSDs continue to become mainstream storage selections for a cross-section of user types, largely due to the higher demands placed on primary system disks by operating systems, games, and high definition media. The SP920 is designed for high performance across a wide range of demanding applications, but it is especially fast in the transmission of multimedia files (uncompressed data). 4KB random read/write speeds are as high as 98,000/88,000 IOPS, with sequential read and write speeds of up to 560/500 MB/sec. In addition to these impressive numbers, the SP920 maintains consistently high read and write speeds even when the disk is 90% full. This is in contrast to some solid state drives that suffer performance degradation as the drive nears capacity. The range of capacities that the SP920 comes in is likely to excite enthusiasts and power users. The initial launch of 128GB and 256GB capacities will be followed by increases of 512GB and a massive 1TB shortly after. The SP920 makes full use of the NAND Flash chip capacity, resulting in a 7% increase in the usable space of the drive over many models currently on the market. For those looking to upgrade from a mechanical hard disk, the SP920 comes with a 2.5mm holder, allowing the drive to be used in both 7mm and 9.5mm bays, as well as a 3.5” bracket adaptor for upgrading desktop computers. Purchasers of the SP920 will now have even more power at their fingertips with the recent release of ADATA’s proprietary SSD Toolbox software. SSD ToolBox provides multiple ways for users to obtain disk information, change settings, and improve SSD lifespan and performance. Combined with the known advantages of solid state and ADATA’s expertise in this area, the Premier Pro SP920 SSD is shaping up as an ideal SSD solution in terms of performance, data security, and stability. The Premier Pro SP9200 is available through selected retailers and distributors for the MSRP of £67.90 (128 GB) and £120.90 (256 GB).